Hey guys it’s Sam, and welcome to the long-awaited return of Jolly Good Bookie! Now, Diary of a Wimpy Kid could easily be the most popular realistic fiction novel of all time; it has inspired a colossus of merchandise including a 3-part movie series, and it has inspired a countless number of realistic fiction titles in its wake. “Wimpy Kid clones”, I like to call them. I’ve read tons of them: Dork Diaries, Big Nate, Origami Yoda, and pretty much every Andrew Clements book, most notably Lunch Money. But I guess the story was successful enough that Kowitt made two sequels, turning Loser List into an official series. This is sequel #1, so let’s see if Kowitt brought homemade to the table, or just went out and bought some pancake mix? In a world full of Wimpy Kid doppelgangers, there’s Danny Shine. He’s returned, he’s ready, and he’s out for revenge! In Revenge of the Loser, Shine has successfully gotten his name off of the Loser List in the girls’ bathroom. But he quickly discovers that the List has become the least of his problems–his radar is focused on Ty Randall, a new kid with two six packs–one of muscle, and one of green tea. He’s contributed to more school programs than Danny cares to remember, with the main focus being on helping the environment. So for good measure, Ty’s a hippie. He’s attracting all of the girls at lunch like a magnet with his handsome looks and his serious tone. Even Danny’s secret crush, Asia O’Neill, is falling head over heels. The jealousy just builds up to the point where Danny snaps and concocts a complex plan to do Ty justice, but unfortunately true colors are shown and Danny must desperately repair the damage before it’s too late. 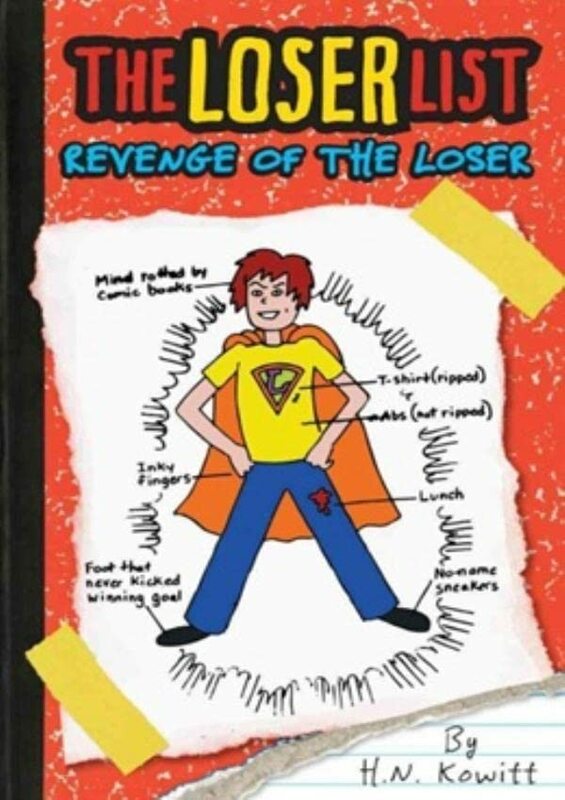 Revenge of the Loser definitely has something new to offer, and the story does focus more on itself than some goofy drawings or copying and pasting from Wimpy Kid. The infamous bathroom wall graffiti does return, but that’s probably as rogue as ROTL ever gets. Well, Chantal is kind of a gold-hearted jerk who shows her true hero at the end. But besides all of these new concepts, Revenge of the Loser is almost the exact same as its predecessor. At least the plot is structured better. It somewhat pains me to say it, but I think Danny Shine has finally done Wimpy Kid justice. There, I said it myself. Revenge of the Loser comes packed with humor and heart–albeit derivative humor and heart–and definitely puts its predecessor in the shadows. Now, let’s just see if they can keep that up for Jinx of the Loser, or better yet, Take Me To Your Loser, hitting stores this September. Because I love my fans, I’ll make this a Jolly Good Bookie double feature! Carpe diem, baby! Anyway, what if A Series of Unfortunate Events met Mysterious Benedict Society? The result would probably be School of Fear, the young-audience debut of Gitty Daneshvari. The novel takes place at a very shady institution that few people have heard of, called the School of Fear. Run by Mrs. Wellington and her assistant Schmidty, the main goal of the School of Fear is to eradicate children’s fears over the course of a summer using “unorthodox” methods. This summer’s students are Theo Bartholomew, Madeleine Masterson, Garrison Feldman, and Lulu Punchalower. Theo is terrified of general death, Maddie of bugs (notably spiders), Gary of deep water, and Lulu of confined spaces. I loved the ominous and gothic feel of the story as it went along, and how it mixed its dark chills and clever thrills with some quality laughs to keep the prose fresh. The story is exciting albeit predictable and tedious, and definitely one I do not regret reading when I find myself awake at 7 in the morning. (No, it’s not insomnia.) It showed that a good way–if not the only way–to face your fears is to tackle them head on, and it shows how difficult life can be while crippled by phobias. This is a good book to relate to; all humans really are afraid of something. However, to me it frankly started to fall apart around and following the shocking climax; I found myself lost in the prose quite frequently on numerous occasions. I also kept asking myself if they were ever going to conquer their fears, but luckily Daneshvari has several aces up her sleeve to shrewdly guide the story. Other than that, School of Fear is a pretty tense and exciting adventure with underachieving predictability and noticeable tedium. I would definitely read the other two sequels in the trilogy–in fact, I have my hands on Class Is NOT Dismissed as I type, and as you read. Well, that was fun, wasn’t it? Be sure to tune in same time next Friday for more awesomeness courtesy of Sammwak! Videos of the Week: “THE PERFECT BOYFRIEND?” and “HOW TO BE A SALAD!” by PewDiePie. I wonder if he’ll become the most-subbed channel on YouTube by the end of the summer. I’M BETTING YOU, FOLKS! We haven’t seen any works of the waistband warrior from Dav Pilkey since The Preposterous Plight of the Purple Potty People six years ago. Yeah, yeah, you might already know how this is going, and you might ask “Sam, didn’t we already go over this?” And we may have already talked about this topic back on 2Sam2Mwak. The most recent excuse Dav put out there was that he was caring for his terminally ill grandpa. Well, although his grandpa is gleefully watching this post from *sniffle* that big bookstore in the sky :(, he is already halfway through his four-book Scholastic contract. And this is the penultimate book on the contract, something he bargained for–but we didn’t. Apparently, Captain Underpants and the Terrifying Re-Turn of Tippy Tinkletrousers came out two months ago while summer was just starting to decay. While I expected it to be a bit more upcoming, I’ll just tell you now. Anyway, the premise of the story–if you didn’t already know–picks up where Preposterous Plight left off. The last time we saw George & Harold, they were being arrested and headed for the slammer. Then Harold spoke thirteen fateful words: ‘”What could be worse than going to jail for the rest of our lives?”, changing the course of time itself forever. 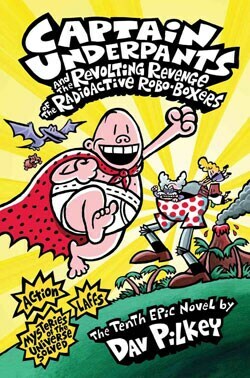 Now, Captain Underpants 9 is the most innovative entry yet for various reasons–one of them being that part of the book serves as a prequel that takes us back to the “good ole kindergarten days”! Now, they’re not fighting aliens or scientists. Now, an afro-sporting George and a not-so-badly-haircut Harold are using brainpower to fight against Principal Krupp’s equally nasty nephew Kipper. Now, let’s go to the (hopefully) real plot: Professor Poopypants (the main villain of the fourth book) had showed up after four books in some sort of limbo. He had taken it in after the defeat of his debut appearance to change his name–but that only made him a laughingstock of a jailbird. But now, he’s back for–most likely–revenge, and he’s got plenty of technological advantages up his sleeve. (One contraption from the last book left anyone who dared to laugh at his new name frozen solid. 8-o) Now, Captain’s had plenty of hard hits (including wedgies) in his past, but the return of an old villain? Totally new. Will this competition leave this scantily-clad superhero’s underwear in a bunch? Or will Tippy be forced to “poopy his pants” once more? Now, since the book’s already out, it’s gotten pretty good feedback. Out of the 9 reviews I saw on Amazon, most people enjoyed the book for its returning laughs and unparalleled entertainment, but some people were more critical over elements like its ending. One specific review from Louisville, Kentucky gave it its only 2-star rating–due to it not actually having any underpants or Klingon in it. And let me inform you that the person that sent this review is a mother. A mother that needs to catch up on her Dav Pilkey. Couldn’t have said those very words better myself. Anyway, you can check out Captain Underpants 9 when it hits bookstores on–oh yeah, it’s out right now. And a small little chunk of my mind is telling me you shouldn’t miss out on the opportunity. And if you don’t want to, you’ve already got plenty of dollars to save up for when the tenth installment (The Revolting Revenge of the Radioactive Robo-Boxers) comes out next January. And in case you’re wondering, yes, Professor Poo–sorry, Tippy Tinkletrousers will be returning for this installment too! Even Sulu and Crackers will be coming back! Again! In this boo–er, first, try to imagine a world without underpants. Not only Captain, but likely undergarments in general. You’d be a dead duck if you got pantsed, and if you didn’t wipe good enough it would go straight to your pants. Anyway, this might be the future of Cap, as–er–something horrible happened to George & Harold. And why couldn’t C.U. pipe up and save them? Since Tippy and his tech-savvy hijinks had prevented the two from creating the waistband warrior to begin with! Now, having broken the yo-yo of time, George & Harold must figure out how to change changed time. It sounds ridick, but it has to happen–or else over a decade of gutbusting adventures will all be for naught. And I already saw a different version of the world as we know it in Preposterous Plight. Will the grandfather clock ever strike twelve? Find out when Revolting Revenge hits stores next year. p.s. Speaking of future dates, Dav’s official website @ http://www.pilkey.com, is currently on hold due to all this Tippy Tinkletrousers madness. He stated that it would be up and running in “a few weeks”–but that’s what it says every time you visit the site. Videos of the Week: If you tuned into my second chopped, screwed, squeezed, and crunched pack of news concerning Adventure Time‘s status in the DVD world, you might have checked out my Video of the Week. It was the first entry in Swoozie’s Cheating series, “Cheating in Middle School”. And if you laughed just as much as I expected you to, ya might wanna consider this 3.4 million-time viewed sequel. And if you thought those were hilarious, there are actually nine more of them left to see! 😀 Next time these guys appear, we’ll see their reaction to the 8-bit cutie Nyan Cat, the Harry Potter 7 Part 2 trailer, and more! And if you like these videos, subscribe to the Fine Bros to see new videos first and like this post, please! I guess that is all for today! Goodbye from Sammwak (check back Friday for a new treasure, mateys! ), and remember: Stay in school, don’t do drugs, share a cherry with a chipmunk, give a monkey a shower, and butter an ant. p.s. Hey, you thought this post was over? HA! You’re wrong, bub! >:) No one’s going anywhere until you see the latest video released today! HE CAN WALL CLIMB! – Yeah, I said the ninja can WALL CLIMB. All you have to do is jump onto a wall, and he instantly clings on. I gotta say, that’s pretty handy for those situations where you’re climbing up a 12-story building, you know what I’m saying? SHURIKEN POWER! – You can throw shurikens after you receive a mushroom of firepower. They’re like boomerangs; they come back to you after you throw them. And I got 2 say, EPIC. There’s no real difference, except when you select Mario, he jumps and hits a ? block rather than jumping in the air oh so randomly. Thx for reading please like and subscribe.